Keep scrolling to the bottom of the site for more event information. 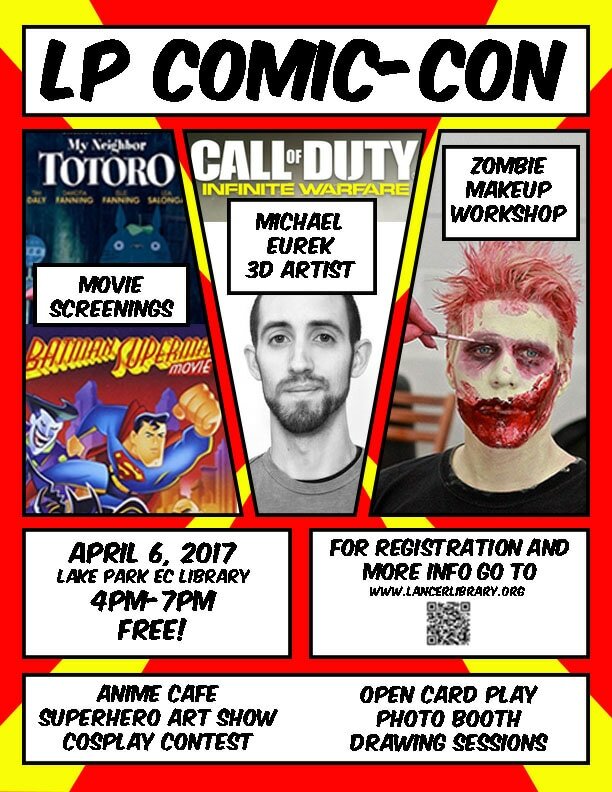 Join us from 4-7pm on April 6th to learn about and celebrate comics, superheroes, zombies, and more. Keep checking back at this site as it gets closer to the event and more details are unveiled. This event is free, but be sure to bring some spending money for a bite to eat and to check out our fabulous vendors who will be selling comics, comic-related goodies, and more! Please keep in mind that all Lake Park school rules are in effect while at the event...including the dress code if you plan to cosplay! register by March 24 at noon! ​All other participants must register by April 4th at 3pm. All artwork should be surrounding the interpretation of a superhero, which could mean anything from your own personal superhero to a comic-book superhero or anything in-between! You can bring your artwork on the day of the Comic-Con. You will receive a certificate of participation and prizes will be awarded. All art should be school-appropriate. If you have any questions or concerns, please do not hesitate to email us!